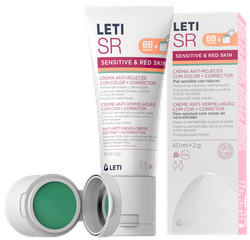 The combination of LETISR products is key to the care and prevention of facial redness (facial erythema due to erythrosis, couperose and/or Rosacea Subtype 1). Concentrated and ultra-restorative formula used for the daily care of sensitive skin with redness. Formula used for the daily care of sensitive skin with redness with SPF20 and UVA. Formula used for the daily care of sensitive skin with redness with colour pigments that unify the skin tone and disguise facial redness. Formula used for the daily care of sensitive skin with redness. With specific corrector that neutralizes facial redness and a tinted anti-redness cream that not only takes care of sensitive skin with redness, but also has pigments that unify the skin tone. 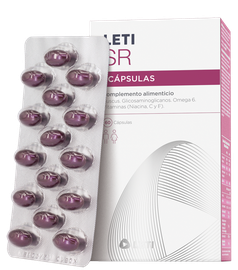 Food supplement in a capsule format that provides the appropriate nutrients for sensitive skin prone to redness. When facial redness becomes chronic and appears on the face permanently, some patients decide to undergo facial vascular laser treatments to reduce it. 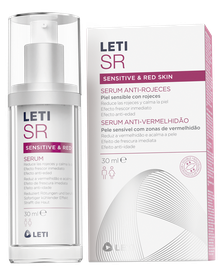 The LetiSR serum is dermatologically tested in after facial vascular laser treatment.